Making desserts with a homemade pastry have always been intimidating to me. The only pastry recipe that I have made multiple times comes from a fabulous empanada recipe I found in my MAD HUNGRY cookbook by Lucinda Scala Quinn. My friend Mike recommended this cookbook to me last year, and I LOVE it. 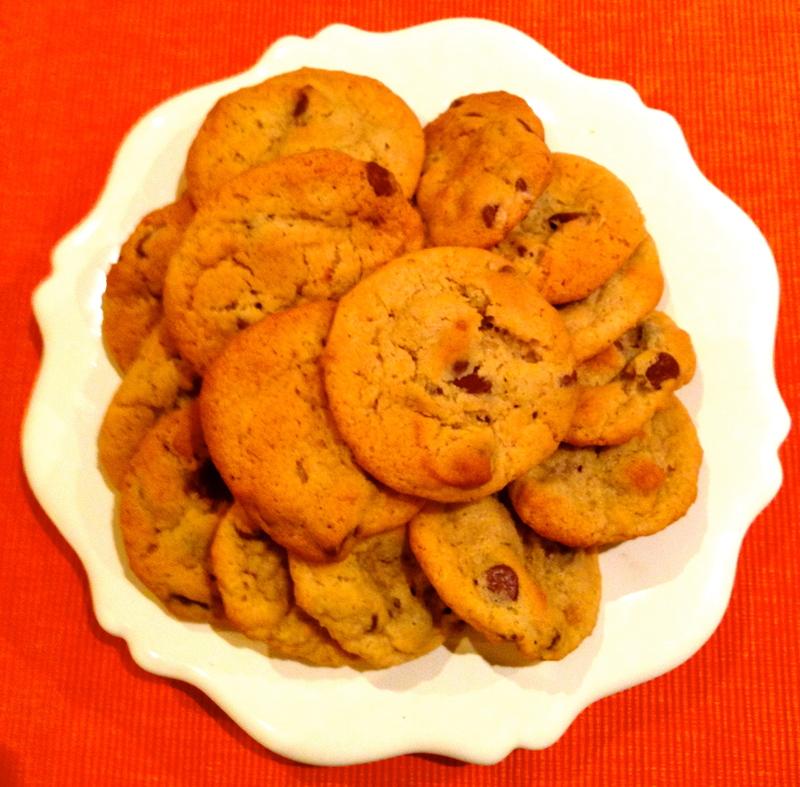 My “hungry” boys have enjoyed several of the recipes I’ve tried from this collection. 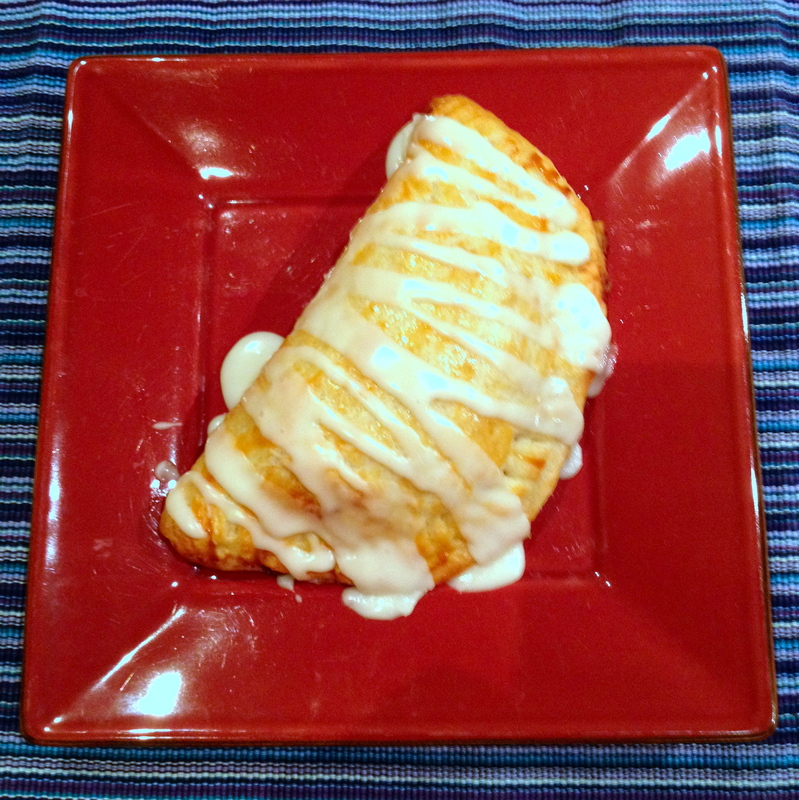 No, I did not make empanadas this time (but writing about them makes me crave them). Today’s recipe came in an email from FARMHOUSE DELIVERY. Those guys are always so good about sending recipes for the produce that comes in our bi-weekly bushel. As I unpacked my bushel this week, those apples just spoke to me. “Make the pies,” they whispered. I could not resist. The pastry was pretty easy to put together, with the help of my Cuisinart. The labor comes in peeling and dicing the apples, but they cooked up quickly. Then you wait while everything cools. The dough was a little tricky to roll out (because I did not chill it long enough). I could not wait any longer! Marc and I shared one the first night, slightly warm and perfectly divine. The second pie went to our friend Paula, who so graciously helped us organize our recent Wine Cru Happy Hour event. The third went to Hill, quickly divided into little pieces for the lunch bunch to try. The fourth went to UUMC for another tasting. I can’t wait to make these again! I am always on the hunt for delicious fruit desserts. If you have a favorite, please share! Cravings for chili have officially begun! My two “go-to” recipes are very different. The first is a more traditional TEXAS chili, the second is a much sweeter version, made with brown sugar and beer, always served with the BIGGEST cheese biscuits I can fit on the baking stone. Today, however, I wanted to try a new recipe. 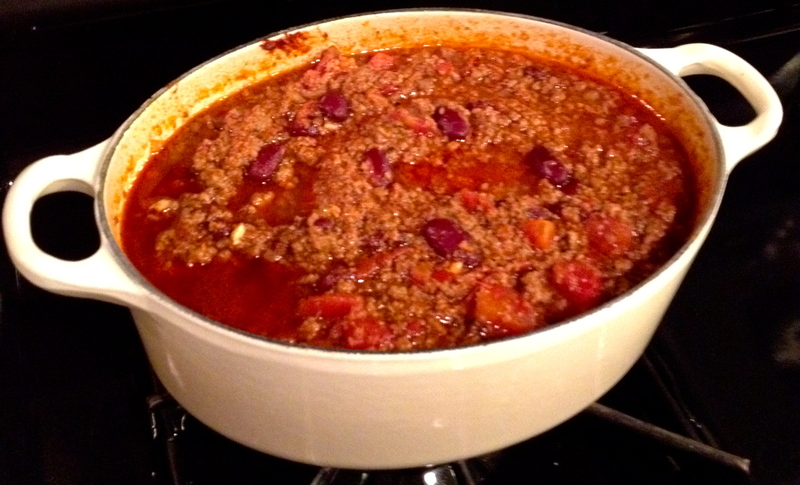 I decided on Martha Stewart’s 30-MINUTE CHILI. Besides the quick prep time, what intrigued me was the addition of canned chipotle chilis and cinnamon. The recipe is also linked to another recipe – CHEESY HASH BROWN BAKE, which uses the extra chili in a new way. This recipe makes a LOT! I thought it was very tasty – a nice, warm spice provided some depth of flavor. I did make a few changes to the recipe. Since my boys are not too keen on tomatoes, I only added one can of diced tomatoes instead of three. I also could not find a fresh package of ground beef that was exactly 3 pounds, so I settled for 2.5 pounds. Neither change seemed to affect the recipe’s success. Of course, I also had to bake up a batch of cornbread – YUM! All of the ERCK boys really liked these – not too sweet, with a good balance between crisp bottom and soft/chewy texture. We had a little “tease” of cooler weather, which found me craving some of my favorite cold weather dishes. 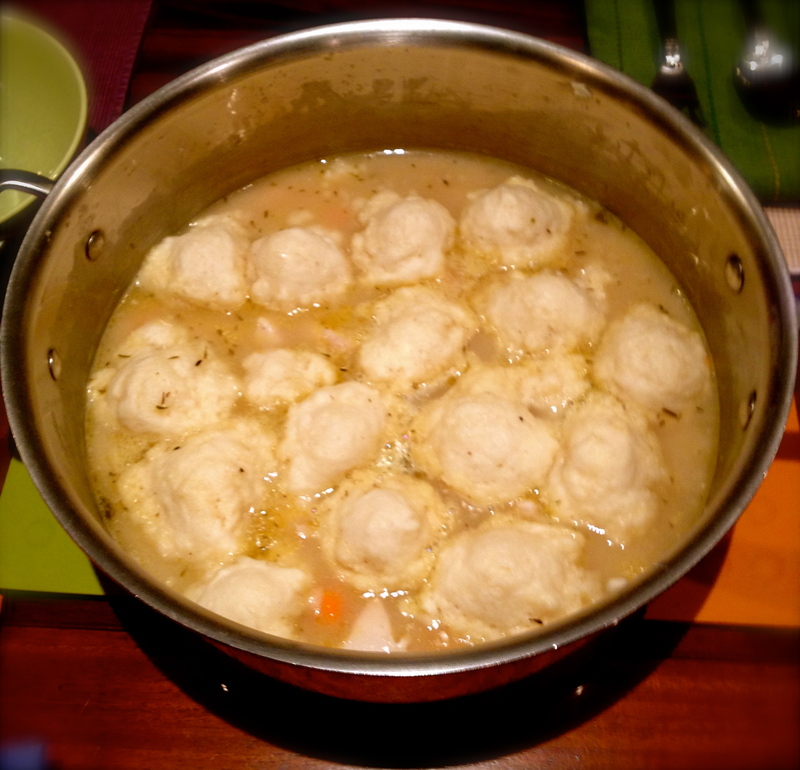 I struck gold when I came across this super easy preparation for CHICKEN AND DUMPLINGS. This recipe comes from one of my first cookbooks, Bon Appetit 30-Minute Main Courses (1995). This is an ERCK staple during the cooler months, very kid friendly and satisfying. Not the most attractive dish to photograph, but here is what it looks like when you take off the cover after steaming the dumplings. Melt butter in large pot over medium heat. Season chicken with salt and pepper. Add chicken to pot and sauté until pink is almost gone, 3-5 minutes. Sprinkle with flour and ½ tsp. or thyme and stir for a minute. ** If you like your broth “thicker”, add more flour. Add onions, carrots and broth and bring to a boil, scraping the bottom of the pot. While waiting for broth to boil, combine baking mix, milk and ½ tsp thyme in a small bowl. Stir until soft dough forms. When broth begins to boil, drop dough by heaping teaspoons onto the simmering stew. Cover the pot. Reduce heat to medium-low and cook for 15-20 minutes (dumplings should be puffed and chicken cooked through). Makes 4-5 servings. 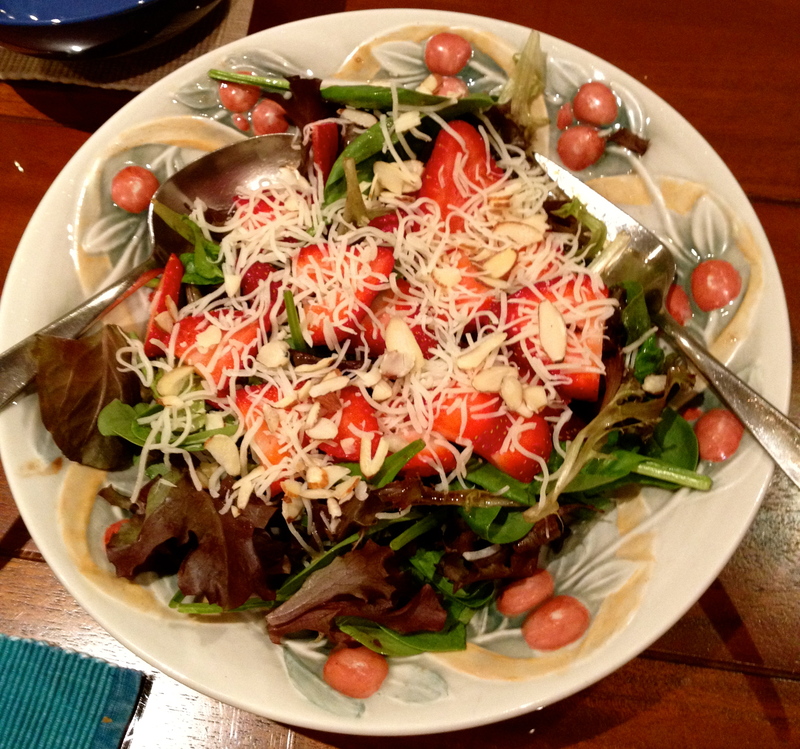 Fresh Baby Greens, strawberries, almonds, and low-fat cheese, served with a homemade balsamic vinegarette. A recent dinner adventure with friends found us curious to try something new. 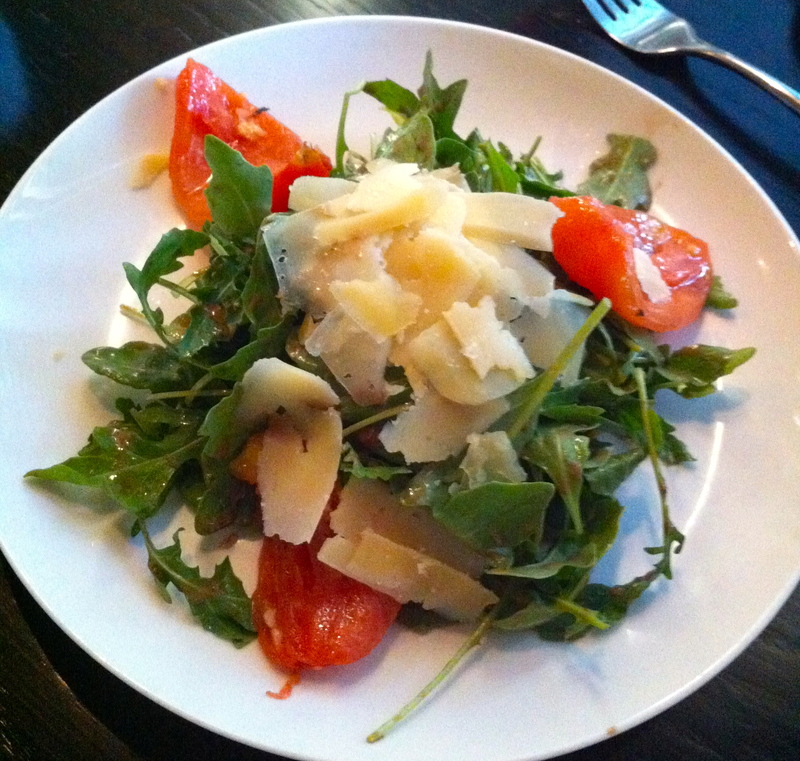 After a little internet searching we decided to take our taste buds to Fabi & Rosi. Located on the west side of town off of Lake Austin Blvd., this small restaurant describes it’s menu as “Classic European dishes with a young and modern twist”. Housed in the old dwelling of ZOOT, the ambience speaks similarly – clean and quaint. 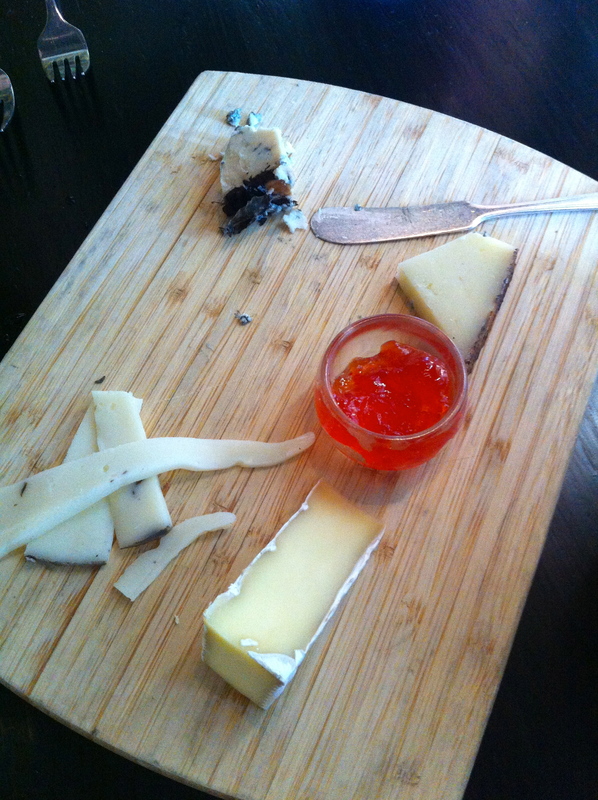 sottocenere / manchego / brazos valley blue & brie – served with a sweet and spicy pepper jelly. 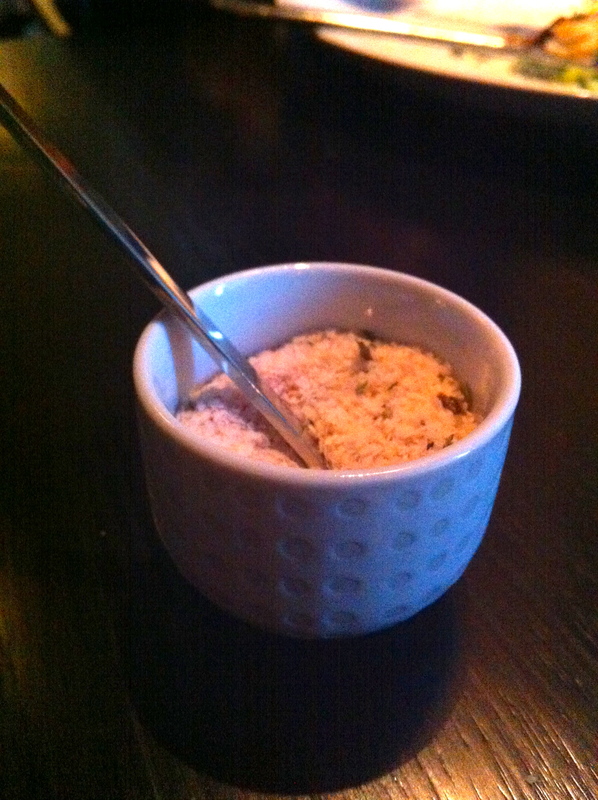 The brazos blue was a stand out, and I highly recommend the sottocenere, with its hint of truffle. We were first introduced to this unique cheese by an Antonelli’s cheesemonger, closely followed by its appearance on the menu at Vino Vino. Everyone at the table selected a different second course. All of them received good marks. 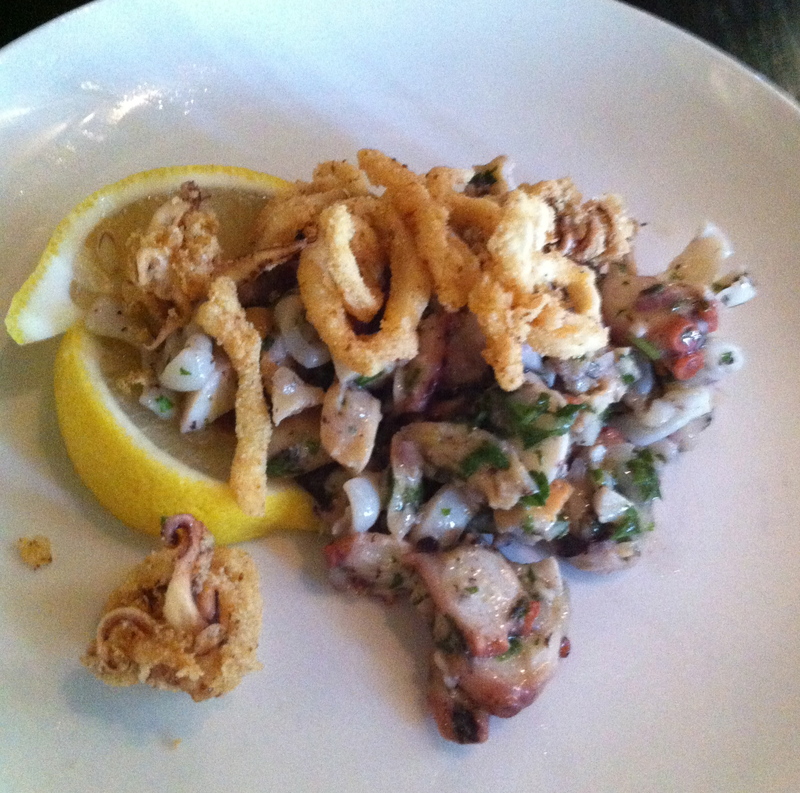 The SEAFOOD SALAD proved the most interesting – almost like a ceviche. For the entrée course, both gentlemen selected the WAGYU STEAK, served with a peppercorn demi sauce and fries seasoned with truffle salt. 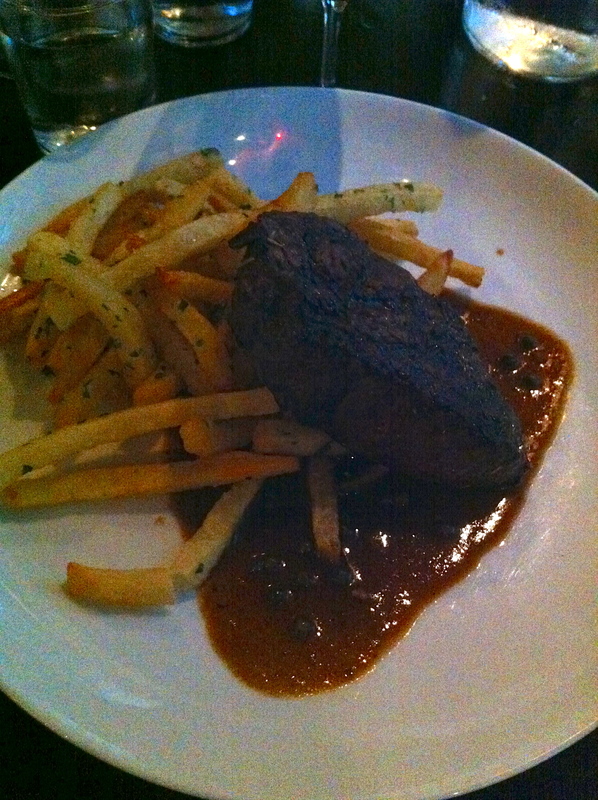 The beef was cooked to perfection, and although very tasty, the fries were a tad over salted. 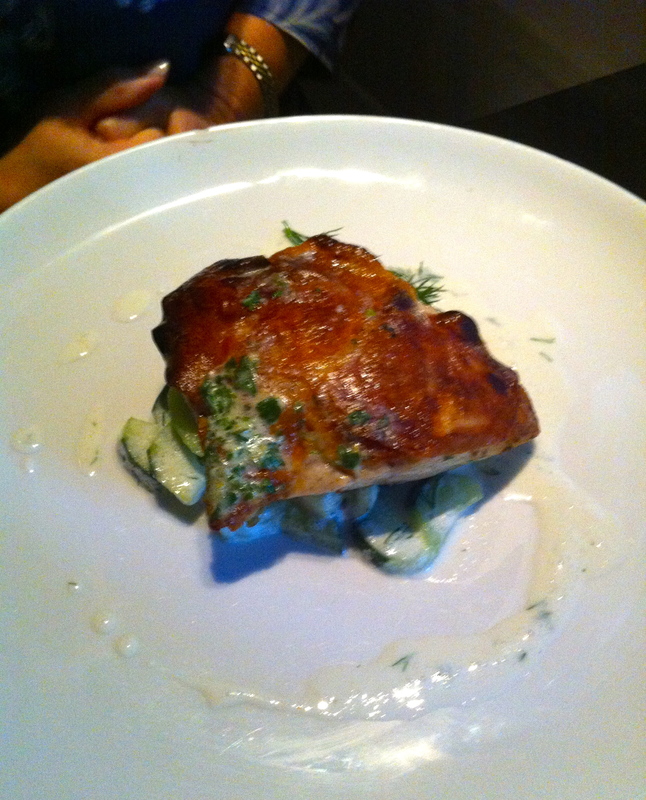 Another dish, The REDFISH, presented itself beautifully, perfectly brown and crisp on top, stacked on potato “scales” and a light cucumber crème fraiche. 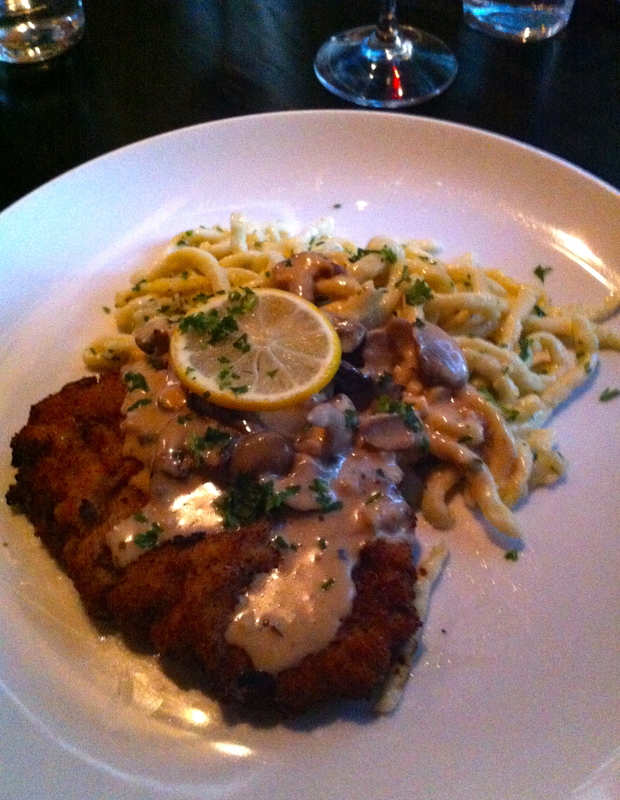 I could not resist ordering the SCHNITZEL + SPATZLE, which turned out to be comfort food personified – a delicate breaded pork cutlet served with heavenly spatzle and a rich wild mushroom sauce. But wait! 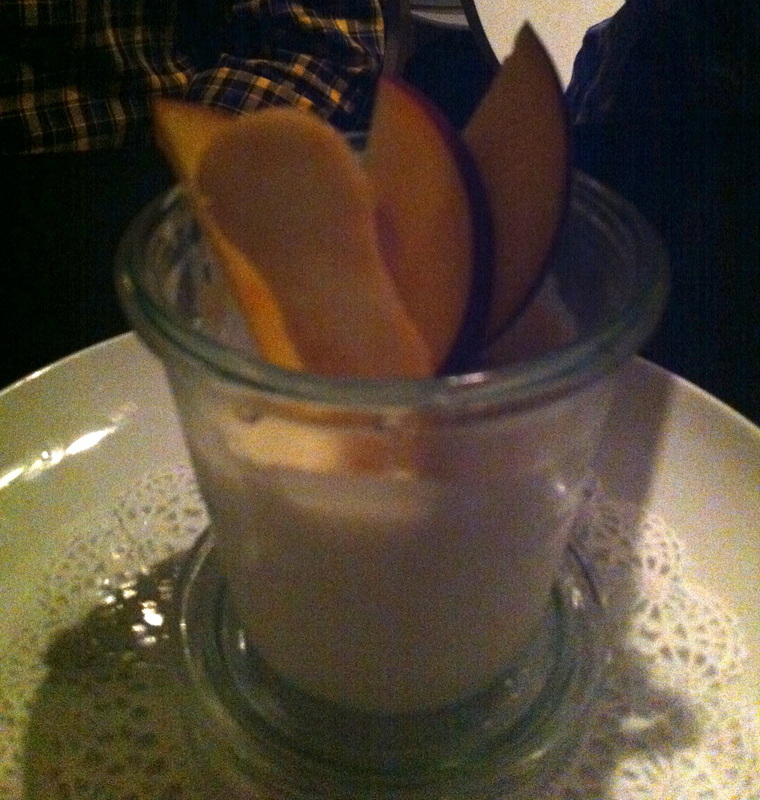 There’s more – dessert! Our server suggested two selections for the table. 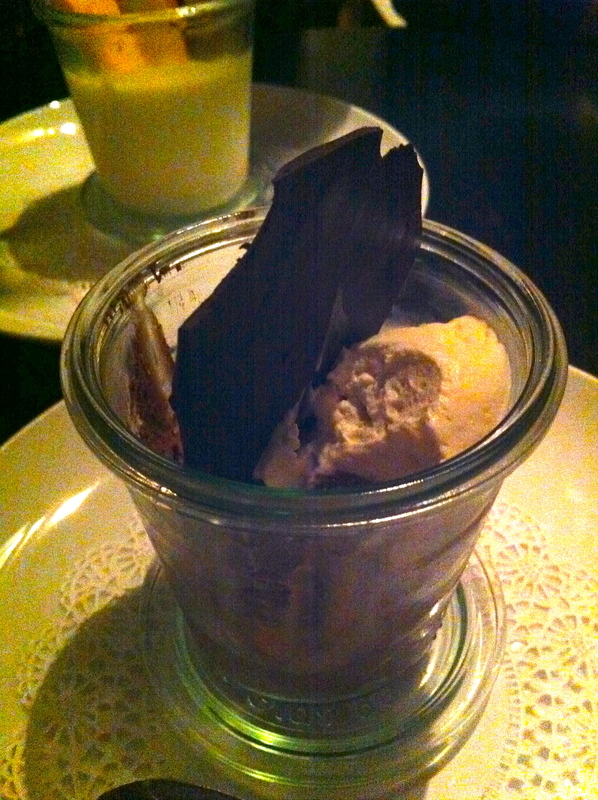 With four big spoons, we dug into a BELGIAN CHOCOLATE MOUSSE and a YOGURT PANNA COTTA . Not sure what this stuff is. We think it’s a special salt. Very cool. 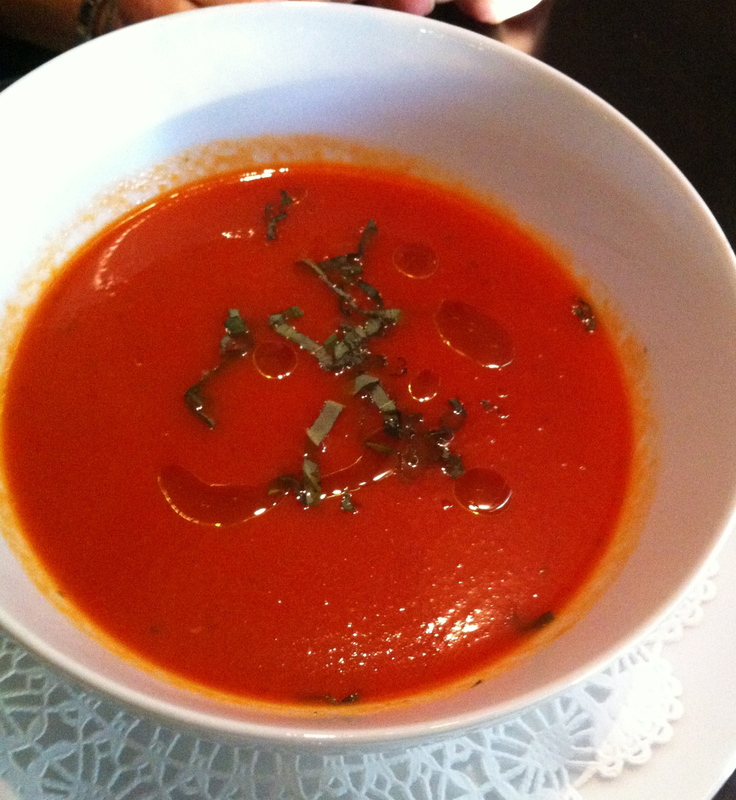 We are overjoyed to have another fine dining establishment to add to our “favorites” list. As you have read, the food was delicious and beautifully presented. Excellent service also prevailed, from the timing of the courses to the assistance in selecting a bottle of wine. Although there were folks waiting in the wings, we were never rushed, in fact, we were encouraged to take our time, which provided for great conversation with some dear friends. 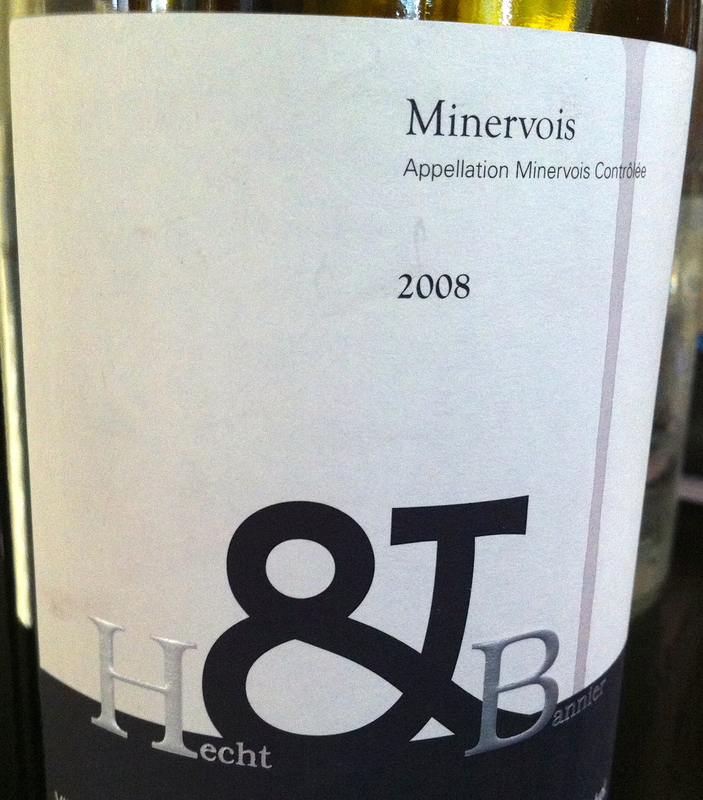 hecht / minervoise / france – Wonderful wine- French terroir with a great spice. Beautiful dance partner with all the food. Also, since most of their bottles are “by-the-glass” wines, we could sample several before taking the plunge. * Pigs in a Blanket – another HEB deal: Buy the dogs, get the crescent rolls FREE! * Chicken Fajitas – HEB fajita seasoned chicken breasts were on sale – $1.97 a pound, so this meal was also a sweet deal. Grilled corn and cherry tomatoes (from our FarmHouse Delivery) add some great textures and flavors to the base of meat, cheese and tortillas. We also had some homemade salsa on hand (also made with FarmHouse peppers and onions) and blue corn chips. Have peppers and seed them. Place them skin-side up on a baking sheet and blacken them under the broiler with oven door ajar to let steam escape. Place charred peppers in a bowl and cover with plastic wrap. When cool enough to handle, peel and chop peppers. 2. Heat EVOO in medium saucepan over medium heat. Add onion and garlic, season with a little salt, pepper and the oregano. Cook 8-10 minutes. Add beer, chopped peppers, tomato sauce and fire-roasted tomatoes. Heat through and reduce heat to low. Cook for another 10 minutes. Pour contents of saucepan into a blender. Blend until you reach the desired consistency. Finally, I do need to give a “SHOUT OUT” to our dear friend that occasionally treats us to beautiful fresh eggs. We scrambled them and served them along side pancakes and turkey bacon (fulfills the bacon craving but better for you). …but WAIT! It would not be a blog entry without mentioning VINO VINO! Yes we have been to VINO VINO since school started. Marc has the pics – perhaps a review is on its way J!